I found my first shed antler–a six-point right side–in 1979 while setting raccoon traps on a public hunting area in Northern Iowa. I was fascinated by what I found, partly because I had never seen a giant buck like that in person, and partly because I had just been introduced to the incredible cycle of growth, shedding and regrowth that takes place each year. It’s a fascinating process that appears nowhere else in nature. Within ten years I was a shed hunting addict and I had found dozens of them, including a matched set that would have easily made the Boone & Crockett record books. I learned a lot from the sheds I found, but one of the things I learned may surprise you. I believe the connection between where you find a buck’s shed antler in relation to where you are likely to shoot him during the hunting season is way overrated. This is particularly true in the northern half of the US and Canada. One matched set I found provides a perfect illustration. I’d been watching a large group of deer that were feeding each evening in a field of soybean stubble. Of the two dozen deer I was seeing, six were bucks and two were big ten-pointers. One late February day, I could clearly see the big, blocky body of one deer that had no antlers and one of the ten-point bucks was nowhere to be found. I knew it was go time. I headed into the thick grove of trees where the deer had been bedding and within five minutes found the deer’s left side. I looked for another hour with no success on the other side. A week later, I found the other side on top of a hill where the snow had blown off, allowing the deer to glean what soybeans they could find on the bare ground. The matched set would just miss B&C. Fast forward to the next winter. I was at an antler scoring event 20 miles away when a guy walked in with a 168-inch 10-point buck he’d shot during that fall season. I recognized it immediately; it was the deer that had shed those antlers in the soybean field. Chatting with the hunter who shot it, I was surprised to learn that he had been hunting the buck on his property for three years and had lots of encounters with the deer. 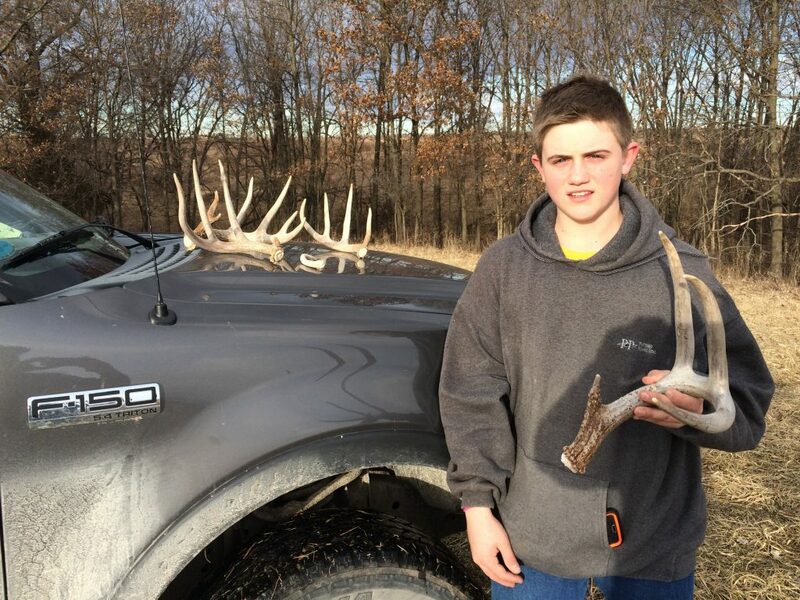 He was shocked to find out that I had picked up its sheds more than seven miles away for his property. I could name another dozen similar situations. During the harsh winters in the upper Midwest and Canada, deer must totally concentrate on two things: Secure bedding cover and food. Nothing else really matters to them. They will find the best food source, even if they must go long distances to find it. Where I now live in Minnesota, deer tend to group up during the winter. These are often termed “yards.” Dozens of deer will be found in a small area where there is food and they can pack down the trails in deep snow to help them escape predators. Finding one of these yards is like striking gold for a shed hunter. It can be like picking up Easter eggs. Finding those sheds is fun, but there’s no relationship to where the buck which dropped them spends the remainder of the year. The one thing that can be learned from picking up shed antlers in this environment is the knowledge of which bucks survived the hunting seasons. Most of the time, if a buck drops his antlers, it’s likely he survived the winter, because they normally drop antlers when the most difficult part of the winter is over. Those -30 to -40 nights in January and early February are the toughest. 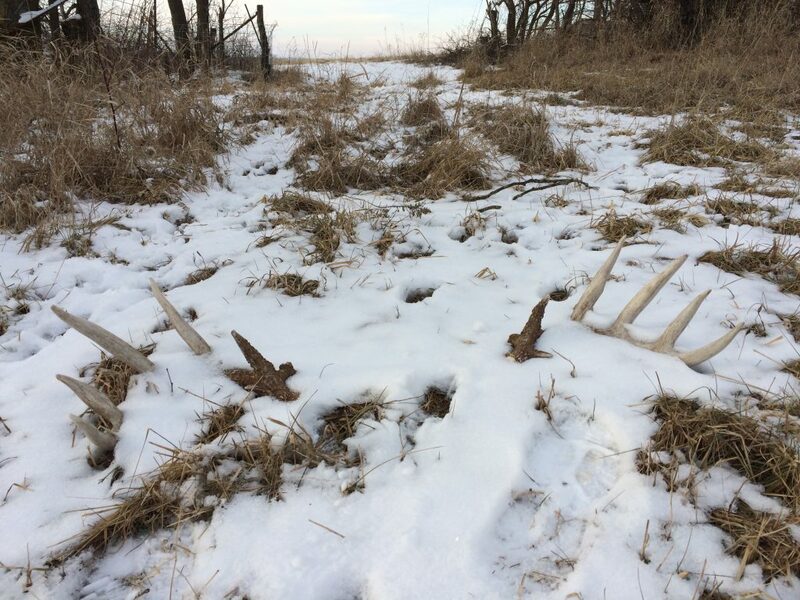 The majority of sheds drop between February 15 and March 15. By March 15, a few thaws are exposing more browse and most deer that are still alive will make it until spring greenup. Even though not much can be learned from picking up dropped deer antlers, there are plenty of reasons to get out and find some bone. 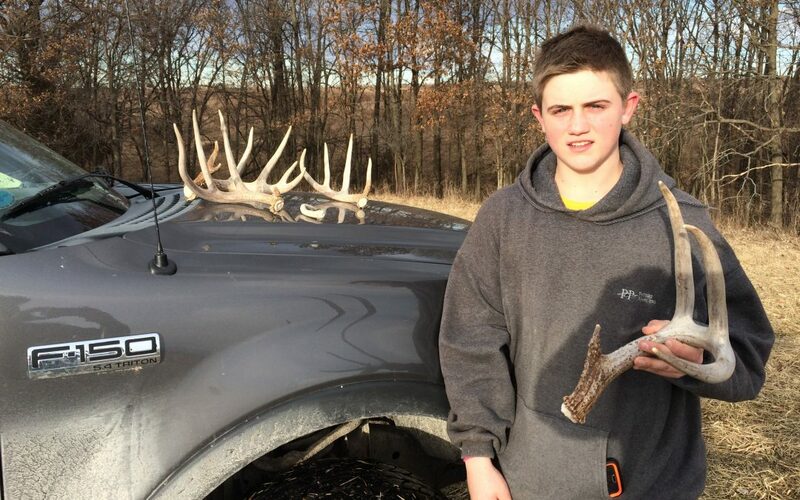 Hunting shed antlers is a great opportunity to get outdoors at a time of the year when there is little else to do. It’s great fun for the whole family, and it provides an excellent opportunity to get some fresh air and exercise. The places you will find sheds in the north are all related to food and the nearby cover where deer feel secure. They have little to do with rutting activity or fall movement patterns. Still, you may learn a lot about deer behavior from looking for shed antlers, even if it’s not the kind of knowledge that will necessarily lead you to a buck during the hunting season. Just being among deer and around the fascinating phenomenon of antler growth, shedding and regeneration is enough.